Southern hospitality was at its finest the weekend of January 27-28 at EP Tom Sawyer State Park in Louisville, Kentucky. The following post and results were provided by the fabulous Oakle “Pete” Petrey. The gym was rocking last weekend as Rodney (Rocket) Grubbs led a strong group of out-of-town players to the Inaugural E. P. “Tom” Sawyer State Park Pickleball Tournament. And, they took a big chunk of the medals home with them! placed second in the MIXED DOUBLES event, won by Niles Cline and Diana Phillips, of Northern Kentucky. Local players managed to hold there own, however, winning medals in each of the four events. 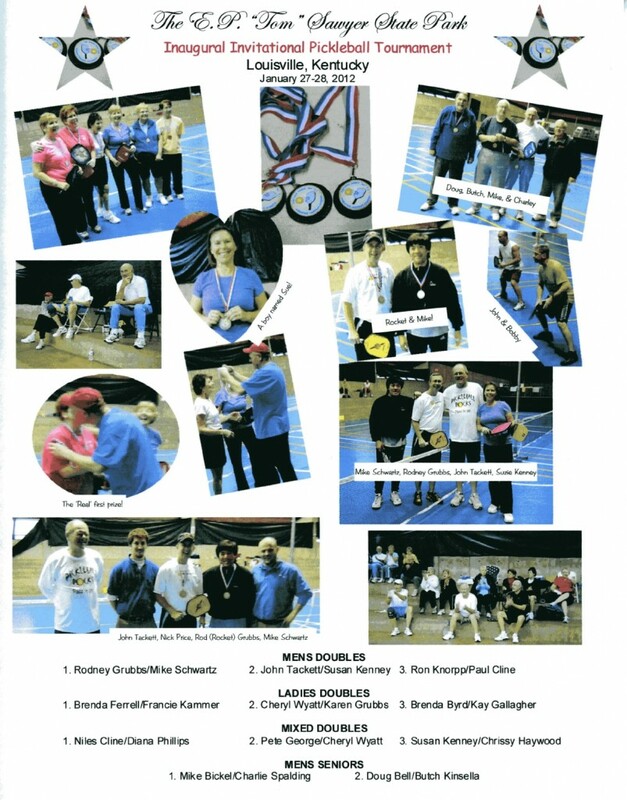 Brenda Ferrell and Francie Kammer won the LADIES DOUBLES, and the team of John Tackett and Susan Kenney* edged out Ron Knorpp and Paul Cline for second place in MENS DOUBLES. Susan*and Chrissy Haywood finished third in MIXED DOUBLES. *Although definitely not male, Susan Kenney was coaxed into playing in the MENS and MIXED DOUBLES because the men were short one player. One pundit named her the “Boy named Sue, Sounds like a good name for a song? All of us are indebted to John Tackett for his herculean efforts in launching what, hopefully, will become an annual event at Sawyer Park. We gratefully acknowledge all the work done by many of the Sawyer Park staff, led by Zack Potts and Nick Price. Bill and Nancy deserve special thanks. They arrived at 7:15 a.m. to welcome everyone. The Hospitality Room was a huge success and all of the many who made contributions earned our gratitude of a job very well done. Last, but not least was the appreciative crowd that supported the players. The WAVE that went around the gym several times was really great.